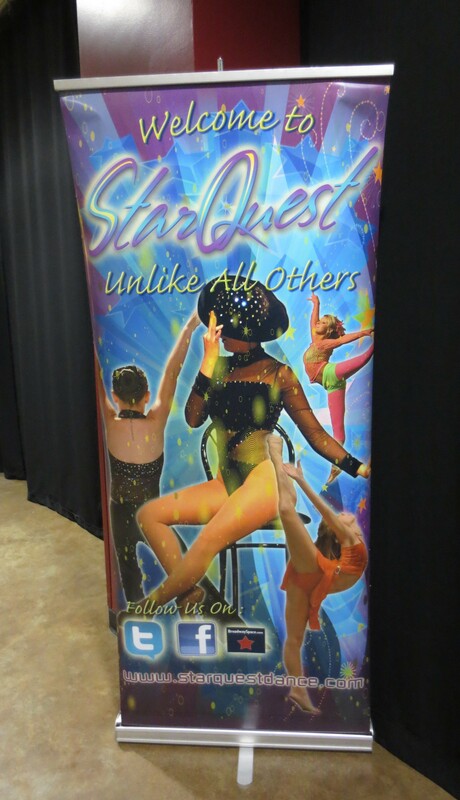 Last week was the Star Quest Dance Competition. This was the first time that Grace has ever had to compete on a week night! I had to pull her out of school around 12:45 on that Thursday. As soon as we got home, I had to do her hair and makeup, and head to the RiverCentre in downtown St. Paul. We’ve been to this location before, so we know pretty well by now to park in the ramp across the street, take the skyway, etc. I know that sitting in the balcony is the best location to see the entire stage and all the dancers. I know that they have mini-donuts on one side of the stage area. Rumor has it, there are smoothies on the other side, except, I have never gotten one. The layout was different for this competition than the last time we were here (which was for Hall of Fame). There was only one stage, on one side of the 2 large auditorium spaces they have. The other “room” was curtained off as an extra large dressing room. It was sectioned off with tables, with each studio having a designated table or two. I remembered it being this way last year too, though this year seemed more organized. My daughter’s group was the only group from Lake Area Dance there that night, which may have contributed to the feeling of having more space. Either way, I liked it! In the back of the auditorium, was the typical “boutique.” There were shirts and all sorts of things available for sale. Unfortunately, I was broke that weekend, so I didn’t even look. I did buy a program, which I believe cost $12, and came with a pen. During awards, they announced that if you went to the boutique and showed them that you were a fan on facebook, they had a gift for you. I wish I had known that earlier, because it was already late, and I wanted to get home. I’m curious what it was they were giving away. If there’s one thing I can say about StarQuest this year, they sure kept the schedule moving quickly! They were at least a half an hour or more ahead the entire evening. It helped that several adult groups weren’t there (they probably were still at work). Awards were scheduled to take place at 10:30, but were done by 10 or so. An example of how they kept things going… My daughter’s tap dance utilizes 10 large desks, chairs, etc. It takes a few minutes to haul it all on stage and get it set up. From the audience, the setting up of props seems easy and flawless. Behind the scenes, there is a lot going on. 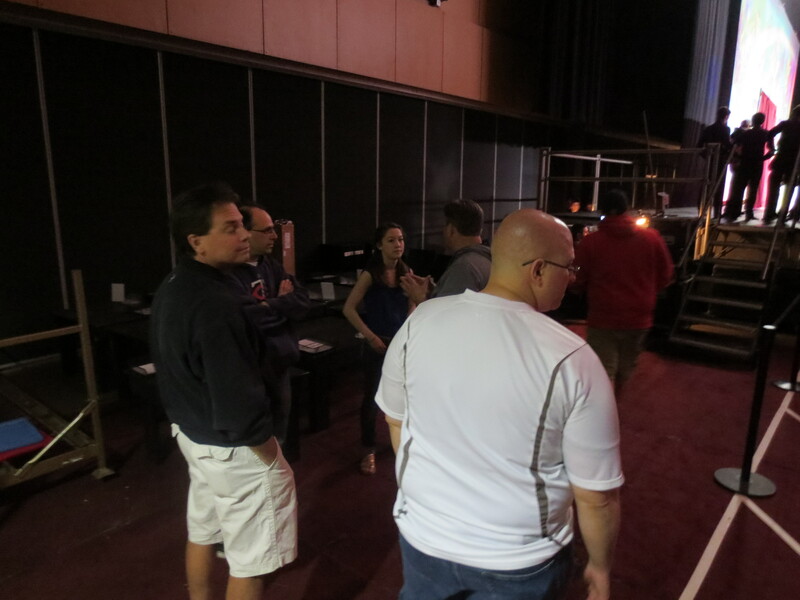 First, the Prop Dads, Assistant Teachers, and Miss Maria (studio owner), all get the desks set up with the other props. Then, they normally set up a “train” of desks that carries the desks on to the stage. At StarQuest, there was a group of several guys that was helping everyone get props on and off stage quickly. I’m not sure if these guys were hired by the competition company, or if they were a group of dads from another studio trying to be helpful. I have seen a lot of that this year (people from different studios helping each other). Whether hired, or being friendly, their help was much appreciated! Next to the stage, there was a fairly large holding area for props. When the group before yours was done, you could just carry them directly on stage. Maybe that is how many of the stages are set up at the competitions, but this was the first I had seen it (with the exception of Masquerade). The catch, was that the dance directly before our girls, also had a large prop. We were worried that both props wouldn’t fit in the holding area. Lucky for us, they found a way to make it work. The changing and setting up of the props took about half the time it normally does, keeping the schedule moving right along! I helped carry chairs and desks on stage, remembering NOT to wear my jacket this time (the program gave no notation whatsoever as to which studio was which, so I assumed this was one that was pretty particular about not cluing the judges in on where dancers were from). I have one thing to say about the program: dance competition companies, PLEASE, PLEASE, PLEASE add a couple of pages for us to keep track of winners. You should see the margins of my program! Every free space around the names of the dances and dancers is full of notes from awards. It would have been really nice to just have a page where I could track at least the top 5 (or however many they wanted to honor). Most of the programs this year have had such a page, StarQuest did not. Here’s a note to all dance companies that have special or judges awards, PLEASE include space for those right in your programs as well! It would make things go so much easier for parents who like to keep track, especially when awards go at Mach 10 like this one did! That’s all I have to say about that, thank you! One other note I had written about this competition was in relation to the music… the bass was a little over the top. I heard a few people complain about the volume, especially of the bass. I alluded to the fact that the awards ceremony went really fast. Seriously, this guy would put a professional auctioneer to shame! He was so fast going through the adjudication portion of the ceremony. There were actually two awards ceremonies. The first one had adjudication only and current Top 5 (in no particular order, of course), along with judges awards. At this point in the evening, our girls had performed their jazz and lyrical dances. We were all very excited to hear that both dances scored platinum! 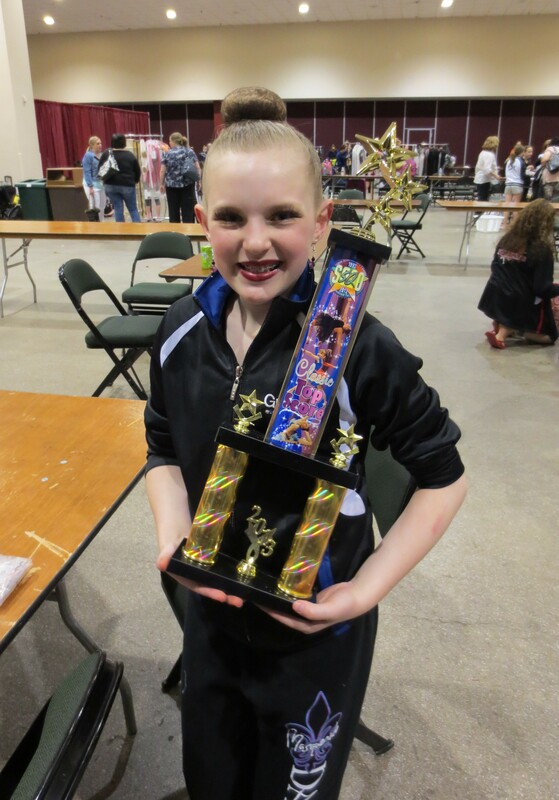 They also received a Judge’s Award for “Terrific Teamwork” for their jazz dance. They were really together, and looked great! After the first awards ceremony, they danced their tap dance. They scored platinum on that dance as well, and received a Judge’s Award for “Fantastic Arms”. I had to laugh a bit at that, because when Grace got off the stage, she told me she had screwed up her arms on the part where they were dancing on the desks. From backstage, I could see something was off, but couldn’t put my finger on it. Anyway, it seemed a bit ironic that the one thing my daughter said she messed up on, they got an award for. I guess she covered it well!?! The second awards ceremony is when they not only gave the adjudication for the dances from the 2nd half of the evening, but also the overall placement awards. What was disappointing was that the announcement of placement awards seemed rushed. He asked that first place winners only come to the front of the stage, bow, and sit back down. I like the little interviews competitions normally do of the winners, and I like when they all line up on the stage. I’m sure this was another way to keep the schedule moving. Our girls barely would have gotten their recognition for receiving 1st place for lyrical, had they not all run up and bombarded the poor guy! They got 2nd place for jazz, and 4th place for tap. Not too shabby! The Angels also got recognized for having the highest scoring number in the jazz category, and 2nd highest scoring tap dance overall. Lyrical was not broken down, as there were not 5 in the category for their age group. They were competing at the Classic level (a combination of recreational and intermediate). Select level is the equivalent of Elite level. I’m very curious how the results may or may not have changed had they competed at the higher level. 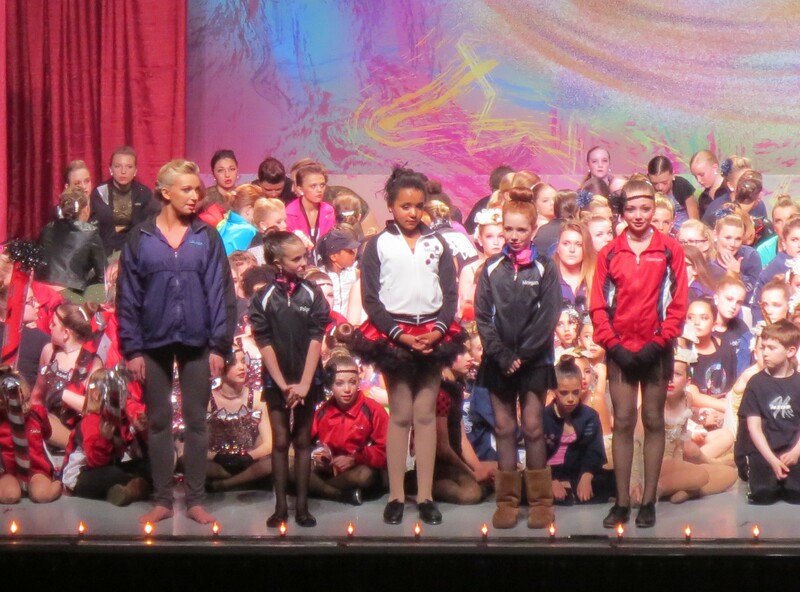 Between their tap dance and the 2nd awards ceremony, there was a long waiting period while many other dances went. The girls (and Daniel) took this time to relax, watch some dances, and just be goofy. At one point, some of the girls were making unicorn faces out of Bugle Chips. Yup, they definitely had a good time!